Mamamia! What A Spicy "And Sweet" Adventure! Review by @Ichigofan and @Jnes5. Bowser has invaded the Star Haven, stole the Star Rod and has imprisoned the seven Star Spirits who guarded the Star rod! Now Bowser's fortress becomes attached to Princess Peach's castle and lifts it up to the sky, sadly the Star Rod makes Bowser invincible, so it's up to mario to save the seven Star Spirits in order to lend them their power to thwart Bowser once and for all! Even though the story isn't anything original, the whole story has quite a cheery and charming tone behind it! The story also has some humor as well, while it's not going to make you die-laughing, it does serve it's purpose of it being very charming and cheery, the game can also change it's tone a little, but not by much, so overall, the story is so good that you can't help, but feel the charming and cheery tone it has us following! The game plays like an RPG, but it has it's own unique twist that's makes the mario RPG's a one of a kind! First thing's first, the game takes place in a lot of overworlds, some of which are long and some of which are small, and sometimes it can include physical obstacles in your way and you, as mario, can jump and use his hammer to overcome most of them, however some might require you to think and explore in order to solve them! 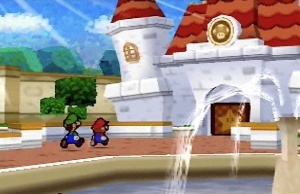 Not only that, the game also includes "partners", which are your allies who can not only help you fight enemies, but they can help you with the game's puzzles that they can only solve, since many of the game's puzzles and boundaries are based upon the abilities of Mario's partners, you can accumulate partners as they advance into different locations. You can only have one partner that can accompany Mario in the overworld, but you can interchange between them at any time, and the best part of all, your partners have no HP so that's means that when they take damage, this results in temporary paralysis on them where they cannot attack, but they will never get KO'd, the gameplay on all the overworlds feel like an adventure-oriented puzzle game, and they keep the game from not being just an RPG. And this is where the uniqueness comes from! One of the things that makes this game unique from some other RPGs is that you can control the actions when mario and a partner or an enemy is going to attack! Fairly early in the game, you will obtain an item called a "Lucky Star" which will give you the ability to use the "Action Command", with this you can influence the power of a move when attacking or defending by timing a button-press accurately or performing some other action command as required, like pressing a button repeatedly, tilting the control stick and letting it go in a certain moment, with this you can double up your attacks and reduce half the damage when you're defending! This is pretty great and it's definitely worth it because it feels like you're helping mario in this game! 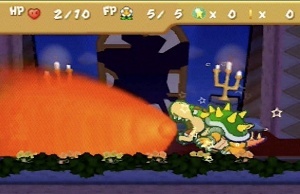 Another thing that is unique in the battle system is that Mario and his partners have a capacity called "Flower Points" (FP), which is the equivalent of magic in RPGs, which these can allow you and your partners to perform special moves, but each of these moves can consume a particular number of flower points when performed, so you must choose to use them wisely. Other things included are the "Star Points", which are the equivalent of experience points, in which unlike other RPGs, you only need to collect 100 of them to level up, and the capacity does not increase in any way, while this might sound easy to level up, here's the thing, when you level up in a certain area full of enemies, those enemies might decrease the number of Star Points they drop but even that, and this is one of the best parts of the game, is that you don't really need to level up in order to proceed! the only thing that you need to rely on, are your skills...and your use of badges! The badges are items you can collect and each of them have and advantage of helping you in a certain manner, like for example, one badge can increase your attack power, one can increase your health, one can give Mario another special move, some can make you invulnerable to some things, and much much more! Each badge consumes a set number of" Badge Points" (BP), meaning that you can only equip a limited number of badges at a time, so choose which are the ones that you think will help you the most at the moment! Different situations may warrant changing badges to make certain boss battles easier! 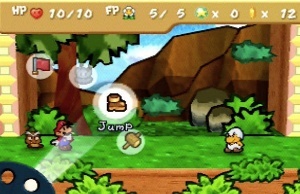 There is also an on-screen gauge to display Star Energy, which is required to perform another type of move if you saved a star spirit, and each of them have a unique move that can help you in battle, and they can raise your gauge as you advance throughout the game, you can also locate hidden battle upgrades in the game's overworld, which promotes one partner character to a new rank once at a time and they can become stronger as well! All of this and more, is why the game is really fun and very unique as well! However, even though some overworlds might not be fun, the game is still very great with it's gameplay and uniqueness! 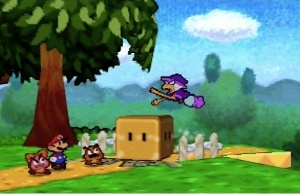 Since the game is called "Paper Mario", the game's visuals feature two-dimensional character cut-out designs contained within three-dimensional backgrounds, and the 2D characters look really good! They look just like a cartoon, and because of that, they haven't aged at all so they look just as good now as they did when the game first released on the N64! As for the 3D backgrounds...yeah, those are the ones that haven't aged well at all, but the thing is, some of those are so bland, that they weren't all that impressive even when this game was first released. Regardless the game's graphics are nice overall. The soundtrack of this game is ok, some of the music tracks are very catchy, some of them set a great mood, some of them are decent, some of them are very awesome... as you can see, the soundtrack has a lot of variety when it comes with its quality. The sounds are cutesy and some of them sound a little bit low quality, but as they are, they sound ok, and as for the voice acting... there isn't any, at all, well except a few mumbles and roars among other simple sound effects, but overall there really isn't any, which is perfectly fine in our opinions! The game is kind of represented as a storybook, the game is divided in chapters, the game's progression depends upon interaction non-player characters (NPCs), who will often offer clues or details for the next chapter, and as I've said, the game does a good job on having a charming and cutesy tone throughout the entire story. As for the replayability, this game has a lot of it! You can collect the badges, you can maximise your level, you can collect the star peices, you can play the minigames included in this game, you can do some hidden sidequests, all of this and more are awaiting those of you who are willing to fully explore this game's world, so there is no worries there if you're looking to be busy with a game for awhile! The Wii U's emulation of the game is spot-on and looks and sounds a little better than the Wii Virtual Console release of the game. The Off-TV-Play feature and rumble-pak compatibility of the game give the Wii U version of the game a definite edge over the Wii version! 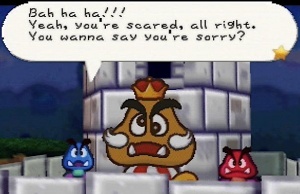 Paper Mario 64 is a great mario RPG! The game has some great gameplay and a charming storyline, and even if there are some things that needed a few tweaks, this game is still a must-but for any Wii U owner! You might be skeptical if you REALLY love Super Mario RPG for the SNES or Paper Mario: The Thousand Year Door for the GCN, but regardless, don't hesitate and buy this if you like RPGs! and as for us, this game gets a great level of recommendation! Our latest review is now live. Great review! This is my favorite n64 game of all-time! Nice review as always @Ichigofan. I agree with the review score. It's easily one of the best masterpieces of the fifth console generation without a doubt! @GeekyGamerZack I fully agree with you!